Canadian agriculture has an international reputation for being highly productive and modern. It plays a major role in the country’s economy, and contributes to 8% of GDP (approximately $110 billion dollars) and 12% of jobs (2.1 million people). Everyone involved in Canada’s agricultural sector (decision makers, producers and advisors) is aware of the environmental issues associated with farming (air and water pollution, land and biodiversity degradation), and is committed to developing sound and sustainable agriculture, the smart use of agricultural inputs (fertilizers, pesticides and herbicides) and conserving natural resources. In order to optimize performance and revenue, while respecting the environment, for the past few years, producers have been counting on a new ally: precision agriculture. Using technologies such as GPS, auto-guidance, variable rate technology, yield sensors, satellite images, drones, etc., precision agriculture is now part of the day-to-day life of farmers. The application of agricultural inputs based on the four Rs (i.e., the right source at the right rate, in the right place at the right time) must be based on scientific knowledge and technical know-how. Such knowledge and know-how are based on reliable, accurate and complete information, which is often necessary on a global scale, but with a rather fine spatial resolution. Satellite images are the ideal tool to provide much of the information required. For about 15 years now, sensors on very high spatial resolution (VHR) Earth observation (EO) satellites have been offering a source of data that can provide information on soils and crops at adequate spatial scales (around 2 m using multispectral imagery) with an unbeatable price/quality ratio. A VHR multispectral image can cover hundreds of fields with a metric resolution at a cost of under $1/ha. More recently, agile satellite constellations, such as Pléiades, have achieved the long-awaited performance in terms of temporal resolution for agricultural applications, namely, a daily revisit, acquisition programming over very short periods and high-speed image delivery. This advantage is critical given that crop health diagnosis is required at very specific growth stages. 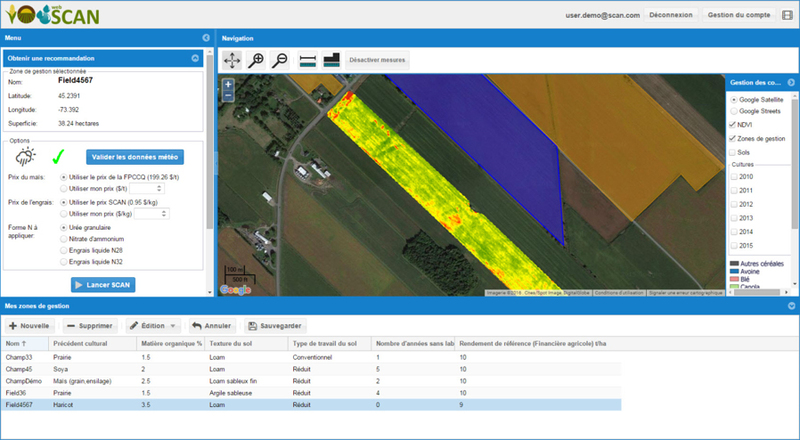 There has been a lot of research on translating satellite data into useful agricultural information, and this research has shown the operational usefulness of this data in the agricultural service sector. Thus, “products derived for agriculture” that are reliable and ready to use can be generated at adequate temporal and spatial scales for applications related to the determination of soil properties, growth monitoring, early disease detection, estimation of input needs (in particular in “variable rate” mode), yield forecasting, damage evaluation, etc. In spite of this real potential, the link in the chain that brings together the phenomenal quantity of data produced by the EO sensors and their operational use to meet the needs of agricultural sector users has to date remained rather weak. Products derived from satellite images for estimating the quantity of nitrogen fertilization to meet plants’ nutritional requirements are a concrete example of such an operational use. Nitrogen is to agriculture what hay is to cattle. Nitrogen is a key element in the molecular structure of chlorophyll, the most important constituent in plants. Chlorophyll allows the plant to absorb sunlight and convert it into energy. With adequate nitrogen supply, the plant transforms more solar energy into biomass and crop yields. Nitrogen fertilization is an indispensable means of increasing crop yields. However, determining the optimal dose of nitrogen is not easy, since it depends on complex interactions between plants, the soil, weather conditions and management practices. By wanting to avoid performance loss due to nitrogen deficiencies, current practices favour overfertilization, which leads to unnecessary costs as well as serious environmental problems: soil degradation, nitrate leaching (source of eutrophication) in the water, and ammonia volatilization (ammonia is a powerful greenhouse gas) in the air. Mathematical and mechanistic approaches to nitrogen cycle and crop growth modelling are very useful for the theoretical understanding of processes, but inadequate for determining the optimal doses for fertilization in practice. In addition to requiring numerous inputs that are impossible to determine with accuracy, these approaches are prone to the propagation of errors inherent to the models of each process. Agriculture and Agri-Food Canada (AAC) developed a model based on the use of statistical analyses for the understanding of the direct relationship between the properties that influence nitrogen requirements (soil, growth, weather and management) and the response to nitrogen fertilization, based on a large number of fertilization trials. These relationships were implemented as a decision-support system (DSS), which is called SCAN (Soil, Crops and Atmosphere for Nitrogen management, ref. Tremblay et al., 2012)), and is based on artificial intelligence techniques that are best adapted to manage imprecise and complex relationships. The satellite imagery acquired at a specific growth stage provides one of the information types required for the operation of SCAN, i.e., crop status. SCAN stands out with two major innovations. The first involves extracting agronomic knowledge related to nitrogen fertilization: studies on this issue have been conducted by applying the meta-analysis technique to databases containing hundreds of fertilizer trials collected from many researchers in Canada and the United States (see ref. Tremblay et al., 2012). The second innovation involves modelling this agronomic knowledge in the form of inference rules in a fuzzy logic system (see ref. Bouroubi et al., 2011). Work is ongoing to advance these two aspects of SCAN and validate it for various agricultural regions, as well as adapt it to various types of crops. Studies carried out as part of SCAN’s development have been cited many times during international precision agriculture conferences, as a major innovation in this field. A SCAN Web platform will be tested by some 100 users starting in the summer of 2016, in anticipation of its commercial use in 2017. In practical application conditions, “intelligent” nitrogen fertilization provides excellent returns on investment, translating into maximum net revenue (optimized crop yields and reduced fertilization costs), not to mention indirect savings related to environmental gains. The use of precision agriculture continues to increase in Quebec and elsewhere in the world (Bouroubi and Bélanger, 2015). With its privileged access to all adequate satellites (in terms of spatial, spectral and temporal resolutions) and its expertise in the production of spatial information, Effigis has developed a range of products that will allow deriving the full potential of these images and respond to the needs of the agricultural sector in terms of soil mapping, stress detection, input recommendations in “management zones” or “variable rates” modes, performance forecasts, etc. These services shall soon be available as a Web mapping platform, with services linked to SCAN (nitrogen fertilization) as well as other complementary services. SCAN will contribute to the democratization of precision agriculture and provide it with significant benefits, thereby ensuring economic gains and sustainable development. 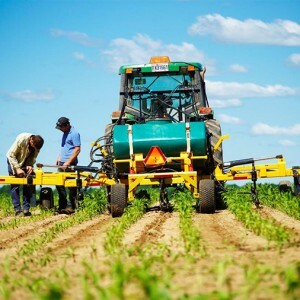 Do you want to learn more about precision agriculture? Contact Effigis and receive a customized solution for your project. Bouroubi Y., N. Tremblay, P. Vigneault, C. Bélec, B. Panneton and S. Guillaume, 2011, Fuzzy Logic Approach for Spatially Variable Nitrogen Fertilization of Corn Based on Soil, Crop and Precipitation Information. Lecture Notes in Computer Science, 2011, Volume 6782, 356-368.